For a long time, JackpotCity Casino has been one of the favorite destinations of players from New Zealand. This online casino has been around for a number of years, offering a great selection of quality Microgaming pokies, attracting Kiwi players who enjoy nothing more than a good slot. Apart from quality games, this casino has always been known for generous bonuses and this hasn’t changed. These days, you can grab a really nice welcome package worth up to NZD1,600 quickly and easily at this online casino. 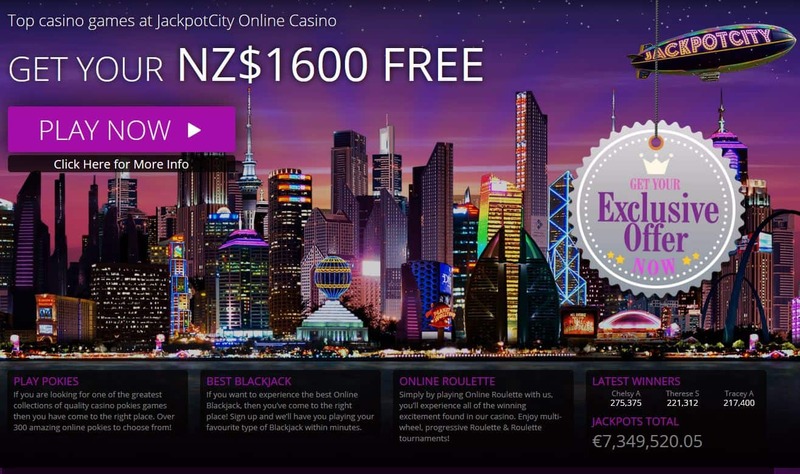 New players from New Zealand looking to get started with JackpotCity can take advantage of a really generous offer worth up to NZD1,600. The welcome offer is divided into four parts, extending over the first four deposits. Each of the bonuses is worth 100% up to NZD400. If you’re wondering what you need to do to claim the bonus, there is no special JackpotCity Casino bonus code you’ll need to memorize or look for. As soon as you make a qualifying deposit of at least NZD20, the bonus will be issued. Although you don’t need JackpotCity Casino coupon code to claim any of the four bonuses, there are still certain rules to keep in mind once you get the bonus. Wagering requirements are 50 times the bonus amount and only games contributing 100% towards the wagering are slots. Table games and video pokers either contribute a very small percentage or not at all. Once the bonus is issued, you will not be able to make a withdrawal until the wagering requirements have been fulfilled. If you request a withdrawal before this time, the bonus itself, as well as any winnings connected to it, will be voided. The 50x wagering is definitely on the higher side but it can be achieved, so if you take up this offer, find a pokie you enjoy, have fun, and try to beat the wagering in the process.